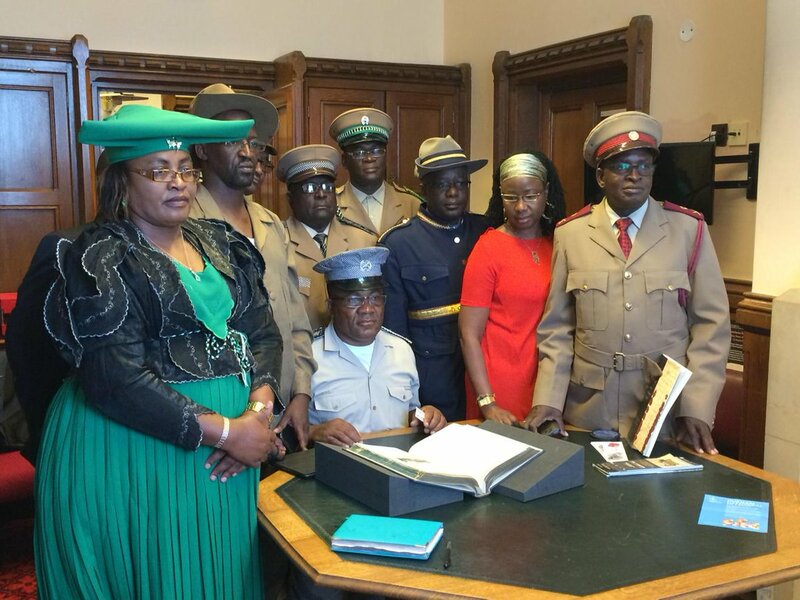 On the 9th July, the Africa APPG, CPA-UK and Doughty Street Chambers hosted a high level delegation of eighteen Namibian nationals of OvaHerero and Nama tribes for a ceremonial reading of the "Blue Book" held in the parliamentary archives. The Blue Book is a British Government report published in 1918 on a genocide committed by Imperial Germany against both populations during the years of 1904-08 in what was then the colonial protectorate of German South-West Africa. The 9th July marked the centenary of the end of German rule in South-West Africa. The Blue Book (full title: "Union of South Africa - Report On The Natives Of South-West Africa And Their Treatment By Germany") was prepared by South African officials in Windhoek, and published in the UK by His Majesty's Stationery Office (HMSO) and presented to both Houses of Parliament that year. The report includes methodologically pursued research including interviews with survivors, is the only written source from the time alongside the diaries of German soldiers and official documentation from Berlin that provides a form of Western evidence on the genocide. An estimated 60,000 to 100,000 Hereros were murdered- approximately 80% of the total population. The Rt Hon. Lord Steel, Hon president of the Africa APPG, hosted the meeting and made a reading from the book and was accompanied by Lord Jones of Cheltenham for the roundtable. Following the meeting Lord Steel asked written parliamentary questions on what representations the UK Government had made to Germany regarding compensation for the OvaHerero and Nama and about the requested return of human skulls taken during the genocide. Baroness Anelay responded that the Government had not made representations to Germany about this. The following the day on 10th July at the weekly German Government press conference, a spokesperson for the Government confirmed that Germany did recognise the genocide. Germany remains in lengthy bilateral talks with the Namibian Government on the subject. OvaHereo and Namibian groups continue to press for space and voice in these discussions.